The shock value of an April Fools prank allowed us to wake parents up to the damage they can do to their children by focusing on their devices instead of their kids. National youth charity Kars4Kids launched an innovative awareness campaign yesterday to educate parents on the negative impact their mobile device use can have on their children. Catching the public’s attention with a shocking April Fool’s prank that broadcast on radio stations nationwide and spread rapidly online, the campaign message is estimated to have reached millions of parents across the country. On April 1st, Kars4Kids introduced their new division, Kids4Kars, a kid donation program. The nonprofit’s widely-recognized and long-running radio jingle was changed for the day, sending listeners to a new website, http://www.Kids4Kars.org. Claiming to accept donations of children “in any condition,” the Kids4Kars program offered a free, lifetime vacation to all donors. Citing a study by the Boston Medical Center, Kars4Kids is hoping to bring awareness to the damage parents’ usage of devices while with their children can have on their children and their relationships. 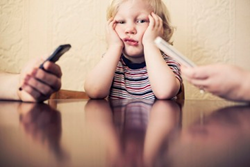 A full 73 percent of parents pay more attention to their mobile phones than to their children during mealtime, a time traditionally reserved for family and focused conversation. The Kids4Kars campaign encourages parents to ignore their devices during times reserved for their children, such as dinner and bedtime. Kars4Kids is a registered 501(c)3 nonprofit organization that works to give back to the community through a variety of education, youth development, family outreach and faith-based programs. The charity provides an array of services to children and families including educational programming, school placement, tuition assistance, mentorship programs, cultural activities, religious instruction, recreation and guidance counseling.